Ann Patchett, SAL, Seattle Arts & Lectures, Town Hall Seattle, What Now? About a decade ago I encountered Ann Patchett’s novel, The Magician’s Assistant. It was in a stack on a bookstore table and commanded my attention in the curious way that books sometimes beckon. When I read The Magician’s Assistant, I was captivated. How did this novelist paint such a curvy road with so much care and luminousity, yet still hold surprises until the very end? I reviewed The Magician’s Assistant and then, re-reading the review, thought that perhaps the author might wish to see it—so on a whim, I drafted a short cover letter and sent it away, in care of the publisher, like my grade school teacher taught me. 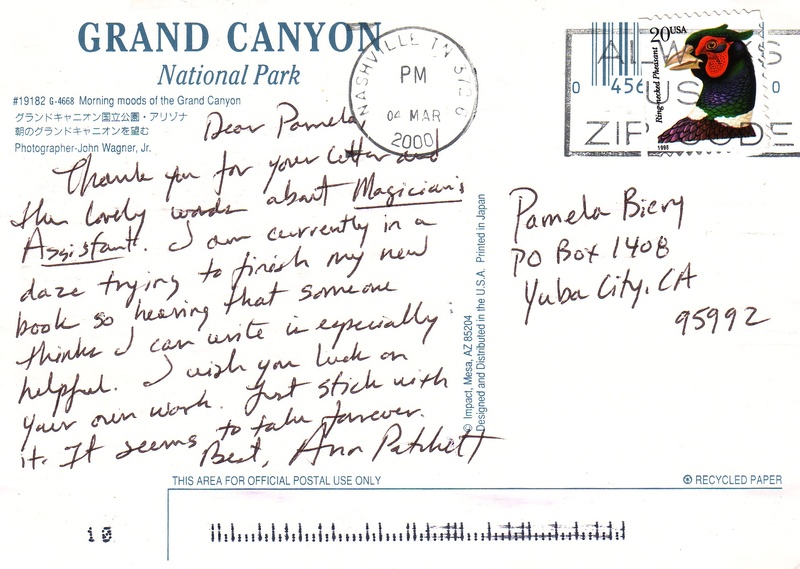 A few months after my review was mailed, I got a postcard from the Grand Canyon, written as if from a friend or sister—informally. The card was from Patchett, with encouraging words and admitting her own dazed state as she was finishing her next book…. which was Bel Canto. Patchett’s fourth novel, Bel Canto was her breakthrough, winning the PEN/Faulkner Award, and becoming a National Book Critics Circle Award Finalist, among other awards. I wondered if my postcard was one of the dozens Patchett described writing next to Lucy’s hospital bed when I read Truth and Beauty: A Friendship, Patchett’s touching memoir about her friendship with writer Lucy Grealy. It is really just a scrap of paper, with some ink and stamps. Nonetheless, the intent, wish and hope that comes along with this postcard has served me well and in the most humble of ways, woven me a bit closer to the story of a writer with a clear path, great talent and the generosity to teach. Ann Patchett will be visiting Seattle Arts & Lectures on June 16, 2011 at 7:30pm, Town Hall Seattle. I hope you will be there with me to give her a warm welcome and to ask at least a few provocative questions. Patchett’s recent writing includes serving as editor of The Best American Short Stories (2006), the novel Run (2007) and the essay What Now? (2008).